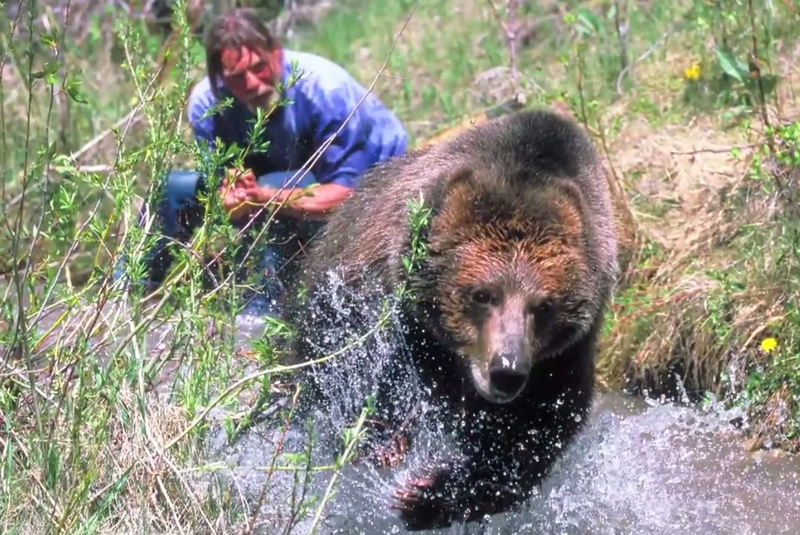 This is a unique glimpse into the heart-warming relationship between a man and their clan of movie-star grizzly bear. At first glance, this 1,240 pound grizzly bear looks like he could rip Doug apart with his claws. And he can! BUT, he would never do it, because he loves Doug, as Doug has been his care taker for his entire life. 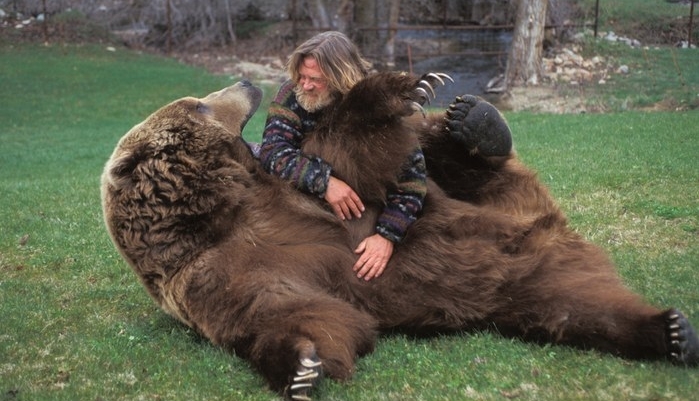 Their unique friendship began in 1977 when Doug adopted Bart from a zoo and trained him to be in films. Bart the bear has appeared in hundreds of films, including The Bear, The Great Outdoors, Legends of the Fall, Clan of the Cave Bear, and The Edge, and he has even appeared backstage at the Academy Awards.Doug says the key to training these animals is to maintain control, because as very intelligent animals they will test their limits and see what they can get away with. 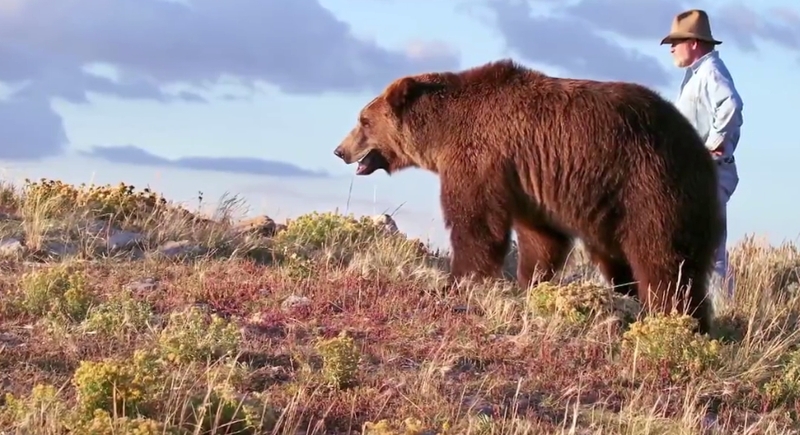 Aware that the grizzly’s future as it still remains today is quite uncertain, Doug decided to buy some property in Montana—habit deemed not just appropriate and suitable, but considered prime habitat for grizzly bears. He purchased 240 acres of wild land adjoining protected land in Pine Butte Preserve along Montana’s eastern front of the Rocky Mountains. Responses to "Meet The Man Who Has Lovingly Taken Care Of a Grizzly Bear For 37 Years "
Bart has been one of my favorite actors since 1991. And we're the same age!love you Bart! I enjoyed all there show when I was growing up and are so happy to see the two of them again. They both look marvelous, thanks to sharing the fine pair, have a great day! can he live in the wild after being kept and taken care of all these years .what if he gets shot by hunters . or another bear gets him .he's such a big teddy bear. Bart and Bart 2 were such wonderful creatures. Some politicians and their corrupt supporters want to destroy the Endangered Species Act and our National Parks and open the doors to extinction of Grizzlies and wolves and other beings. This must not happen. Stand against evil, protect the ESA. IT IS NOT A GIFT FROM GOD. 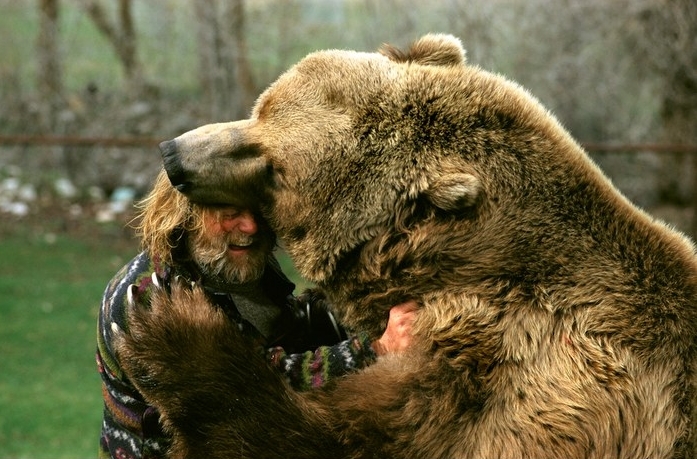 IT IS WHAT NATURE AND THE BEAR DECIDED TO LOVE. 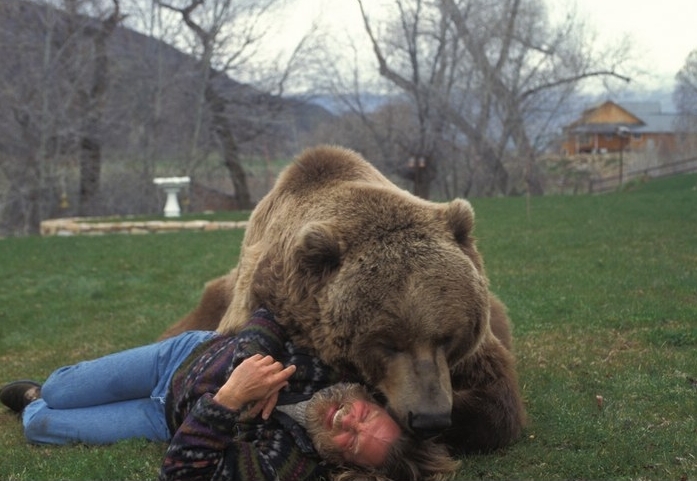 What a beautiful bear Bart is. I love him in the movies. Thank you foy caring for him all these years. You are one very special man Doug. The love between the two of you is wonderful. Thank you for sharing him with us all. 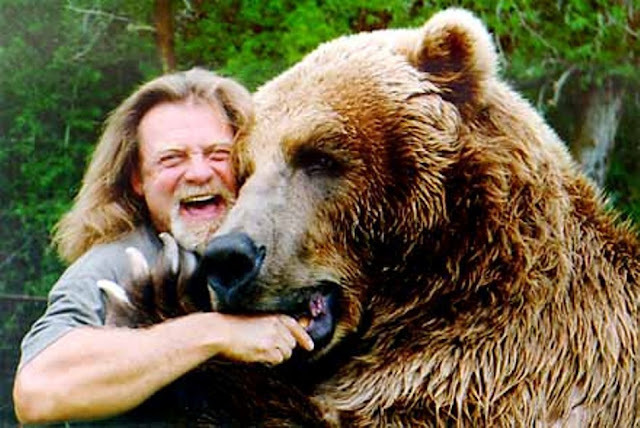 I love grizzlys I believe when I die I will be reborn as one and when one dies they become human.. Bart is an inspiration to me in ways, and his trainer I commend him for doing a awesome job of raising Bart!! Bart tragically died in 2000. Little Bart, and Honey Bump carry on his legacy. It appears he likes chewing on Doug's head! 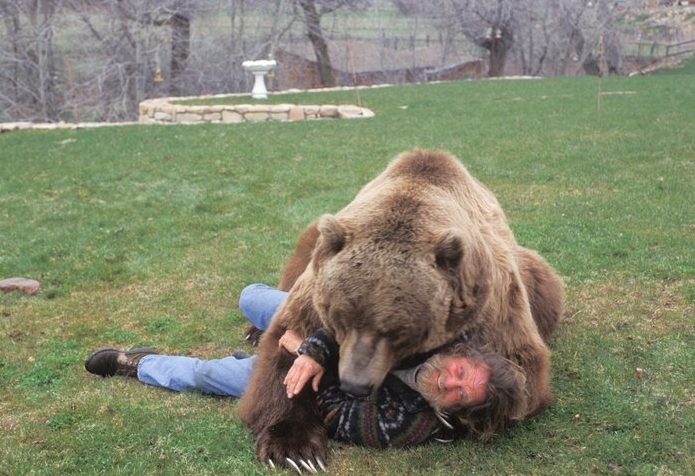 Love the trainers expressions in th pictures, looks like the grizzly bear brings out the grizzly bear spirit in thr man. 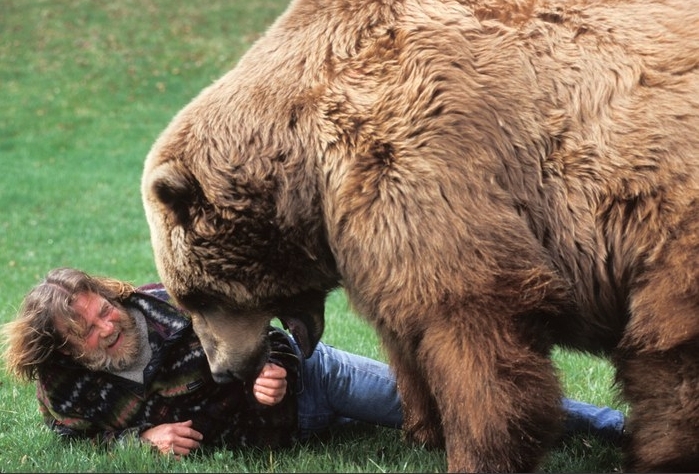 The bond between man and grizzly is totally amazing. 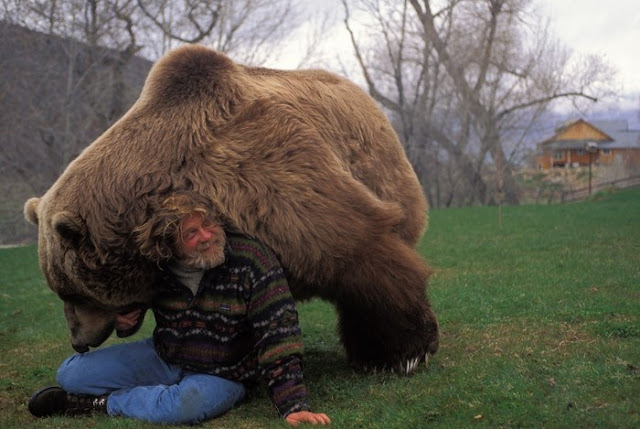 Grizzlies and wolves need continued protection under the ESA, so many want to kill them just for trophies.